Keep your jewelry, cosmetics, and other accessories stored neatly inside this attractive, modern jewelry armoire. The full-length mirror is perfect for applying makeup, checking outfits and mixing and matching jewelry and while getting ready for a day or night out. Moreover, this original jewelry armoire features a locking system that will keep your valuable jewelry protected while you are away. 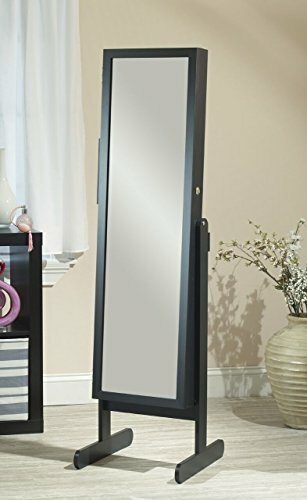 The Mirrotek Jewelry and Makeup Armoire is an excellent decorative and functional piece of furniture that will improve your accessorizing and makeup routine by keeping all of your jewelry and cosmetic collection organized and by adding a hint of notoriety and style to your home decor. You can store and organize your jewelry and cosmetics inside this locking armoire and convert it into your own personalized beauty station. Sturdily crafted out of natural wood and finished in an elegant shade of black, versatile with other furniture or room decor, this jewelry armoire guarantees a highly organized system for your jewelry, cosmetics, and accessories, by saving up space in the case of small bedrooms, dressing rooms or even houses. The full-length mirror that opens up as a door reveals the armoire’s interior compartment system which features large cases, hooks for bracelets and necklaces, compression folds for rings and slot pairs for dangling and studded earrings. Besides this, you can store your makeup accessories on the deep-cut plastic shelves, two deep cup plastic shelves for brushes, cotton balls, etc., and three wood shelves for bottles. 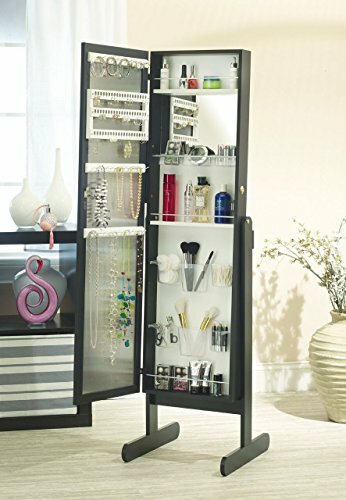 Now, with this perfect jewelry armoire your makeup routine and dressing up process will become your favorite activity, because it offers an incredibly advanced storage system for all types of jewelry and cosmetic collections, creating a contrast with the existing furniture and making your bedroom, dressing room or even retail store classier with its elegant black shade and classy design.